It raises profound questions: about the Government's commitment to reversing the decline of small towns and the socio-economic blight it brings; about An Post's conduct as a semi-state company accountable to the taxpayer; and about local democracy in Ireland. The new location An Post has chosen for Thurles (without any public consultation) is almost 1km from the town's square and bus drop-off points used by pensioners and people who have no other means of travelling into town from rural areas. As one older person dismayed by the Thurles move said during last week's public protest: "I live alone and rely on the bus to get into town on Fridays for the pension and my shopping. "I'm not going to manage the walk to the shopping centre if the post office moves." Defending the closure, An Post's public affairs manager Angus Laverty wrote in an email reply to a concerned local business owner: "We need to be where our customers are both now and in the future." Financial services and e-commerce are prioritised ahead of the company's remit to serve the needs of local communities. Mr Laverty has explained the decision in the context of an "ambitious transformation programme offering a new-look retail offering for customers including a move away from old-style post office counter layout. This is driven by An Post's move to offer a host of new services and products to customers, including financial services and integrating its growing e-commerce business." These new layouts of post offices, he added, "will include dedicated customers' areas, parcel lockers and self-service options." An Post chief executive David McRedmond has even suggested recently that he wants more post offices to "co-locate" within supermarkets. 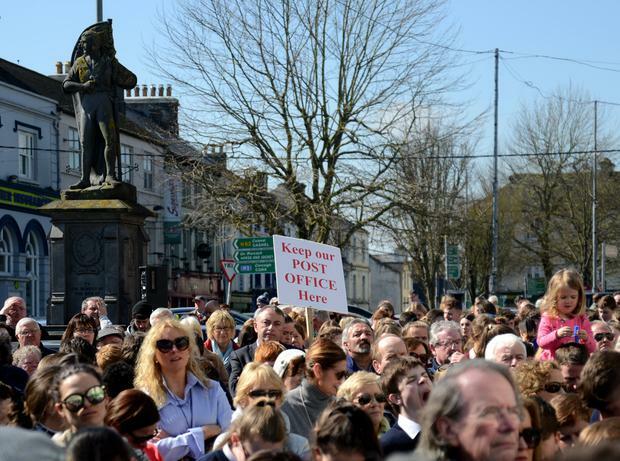 Unlike Dublin and the other Irish cities which have rebounded from the effects of the financial crash, many of Ireland's rural towns - Thurles included - are still struggling for survival. Official Government strategy, as highlighted in the Ireland 2040 Plan, acknowledges the threat, emphasising as a priority the protection of small town centres against further decline. National Policy Objective 15 aims to "target the reversal of rural decline in the core of small towns and villages through sustainable targeted measures that address vacancy and deliver sustainable reuse and regeneration outcomes". An Post's decision to close a viable town-centre post office surely flies in the face of this strategic objective of national interest. An Post's move seems to make little economic sense even on its own terms. We have all seen the serious consequences recently in Britain and France (with Brexit and the 'gilets jaunes' unrest, respectively) of the perception in economically struggling regions that they have been bypassed by investment and then kicked in the teeth by policies which deny them any hope of economic recovery.